But before she began to handle the case, Orozco received an unexpected text message that asked her to go downstairs immediately to another courtroom which had already requested an interpreter three times, but no one showed up. Even though it was not her assigned work floor, Orozco rushed downstairs to take care of the case, leaving the two floors of courtrooms assigned to her unattended.In front of the judge, Orozco stood on the right-hand side of her client, a middle-aged man who has trouble expressing himself freely in English in a stressful court setting. In a gentle voice, Orozco interpreted whatever the judge or the public defender said to the man and interpreted what the man said to the court. Orozco spoke at a surprisingly fast speed, almost simultaneously with whoever was speaking. After finishing up the case in half an hour, she rushed back to the courtrooms upstairs and found an attorney and a client waiting for her to do a brief interview in the hallway. Hurrying from one courtroom to another and receiving last-minute notices of work is becoming commonplace for court interpreters. So is finding out somebody waiting for interpretation services. “We are always running from one courtroom to another,” says Veronica Rivas, a session Spanish court interpreter hired by Cook County. “Lately it has been worse and worse,” Rivas says. In Cook County courthouses, thousands of non-English-speaking immigrants rely on under-appreciated professionals – court interpreters – to make sure they can understand the legal processes they are facing to defend themselves and fight for their rights. But in recent years, due to retirements and for other reasons, the county has been losing full-time interpreters and relying increasingly on part-time, per-session interpreters. The shortage results in delays of basic legal proceedings, such as attorneys withdrawing from a case. Some legal cases drag on unnecessarily as a result, according to several court interpreters interviewed for this story. Advocates say deficiencies in the county’s interpretation program mean vulnerable immigrants may not be getting adequate legal support, which potentially affects a wide swath of the county’s population. Cook County is home to 743,200 people with limited English proficiency – around 15 percent of the total population. “We clearly do not have enough interpreters. The courts are not being served,” says Craig Rosenbaum, executive director of the Chicago News Guild, a local labor union which represents court interpreters, professional employees as well as newspaper reporters. “Our members represent people from communities that are under siege, particularly those from Latino, Arab and Polish communities,” he says. “I think we miss a lot of cases. Lots of people resolve it through either relatives or friends, because they don’t want to wait. Sometimes a judge doesn’t want to wait for the interpreter,” says Norman Larreta, a Spanish-speaking court interpreter who has worked for Cook County since 1999. When there is no interpreter available, “what the court system has been [doing] is just waiting for the interpreter’s appearance, or just giving another court date, or using Spanish-speaking personnel, one of the staff members, to interpret,” says Jose Alvarez, a Spanish-speaking interpreter hired by Cook County. “It’s become a norm [to use bilingual staff members as the interpreter].…because they know we’re busy. They know we’re understaffed,” Alvarez says. But concerns regarding the shortage of court interpreters are disputed by the Office of the Chief Judge. “The number of court interpreters is sufficient to meet demand, and interpreters are provided upon request,” says Pat Milhizer, communications director at the office. In 2003, the Circuit Court of Cook County had 39 full-time court interpreters. In 2016, it had 31 full-timers. Now, there are 26. While at least five interpreters left in the past five years, the last time the county hired a full-time Polish-speaking interpreter was 15 years ago and the last two Spanish interpreters were hired four years ago, says Grace Catania, a Polish-speaking interpreter who has been working in the county courtrooms since 1994. Catania is also the president of the Chicago News Guild. Last year, approximately 58,000 sessions of interpretation were conducted in the county’s criminal courts, dropping by 31.6 percent from around 85,000 sessions in 2015, according to the quarterly performance metrics published by the Office of Chief Judge. The sharp decline, as explained by the county’s budget for Office of Chief Judge in the 2019 fiscal year, is due to “staff reductions in recent years,” and the “timely service” of interpretations was “hampered” due to “geographic dispersion” – meaning the distances between courthouses. For part-time court interpreters, unexpected changes in work include being sent to another courthouse during the day. “I could easily be in the juvenile court part of the day and then get sent out to domestic violence court for the other part of the day,” says Elsa Prado, a Spanish-speaking court interpreter, referring back to her years of work as an employee of the Office of the Chief Judge. Over the past five years, Cook County has been cutting its workforce in the Office of the Chief Judge, which is in charge of all administrative functions in courts and employs around 3000 people, by 10.2 percent or 324.4 full-time equivalents. 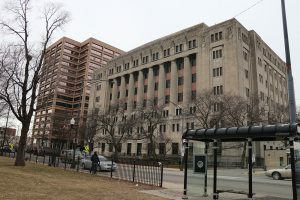 The inadequate staffing of courts has hampered courts across Illinois for many years, which includes the Circuit Court of Cook County. A 2013 survey by the Illinois State Bar Association found that 91 percent of Chief Judges reported the size of court staff as somewhat inadequate, which includes the number of court interpreters. According to the annual report of the Illinois Courts, in 2017, 50 percent of court interpretations were conducted by unregistered interpreters who have not been assessed for language proficiency or interpreting skills, and only 14 percent were conducted by certified interpreters who have passed the written and oral examination designed by the Administrative Office of the Illinois Courts in 2015. For Cook County, 20 court interpreters are certified, accounting for 25 percent of the total 80 interpreters, including both full-time and per-session interpreters, according to Milhizer. Many of them are still in the process of getting the certification. Being slow in recruiting new full-time court interpreters, courthouses in Cook County have been relying increasingly on part-time, per-session interpreters, which creates uncertainty for the interpretation services, as part-timers can cancel their assignments. According to Milhizer, session interpreters are permitted to cancel an assignment up until 8:30 a.m. in the morning of an assignment with no adverse consequences. “The county doesn’t pay as well as the private [sector] or DuPage County, where I also work as a court interpreter,” says Pawel Smal, a certified session Polish-speaking interpreter of Cook County. While per-session interpreters, unlike full-timers, have the freedom to cancel assignments, they can take job opportunities offered by other entities with a higher hourly wage, leaving Cook County courts with inadequate manpower. “Not having a guarantee of employment, I tend to gravitate towards jobs that pay more and cancel assignments with the Cook County,” Smal says. Claudia Perez, 45, has been working for the county as a session court interpreter for more than 12 years. Like all her fellow per-session interpreters, Perez has no health plan, no dental plan, no sick pay, and no paid vacation, despite the fact that she works three to four full days per week and that part-time employees are supposed to get the same amount of benefits enjoyed by full-timers. In 2015, Perez got nine months of health insurance. But the county decided to withdraw her health plan and cut off her working hours in the following months to disqualify her from employee benefits. “Because the county doesn’t want to pay for health insurance, they limit my hours,” Perez says. The threshold for an employee to have benefits is 30 hours a week, according to several court interpreters. And some per-session interpreters are assigned 28 or 29 hours of work a week, just below the amount of work for them to be qualified for benefits. A single mother of four, with one son already married, one girl in college and two girls in high school, Perez says working as a session court interpreter is no longer a stable job. “I have to find an extra job or two. It really has caused a lot of hardships,” she says. “It’s not fair that we don’t have any benefits. Because we work as well as others,” says Veronica Rivas, who is also the chair of per-session court interpreters at the Chicago News Guild. In an ongoing contract negotiation with Cook County, the labor union is demanding the county to have 30 full-time Spanish-speaking court interpreters, seven Polish, and two Arabic. It is also asking the county to provide sick pay for per-session interpreters, based on a Cook County ordinance passed in 2017, which entitles any employee in Cook County who works for least two hours in any two-week period to have one hour of earned sick leave for every 40 hours worked for their employer in Cook County. “We are literally the voice, the eyes and the ears of people who cannot speak English,” says Elsa Prado, a long-time Spanish per-session interpreter who has worked in Cook County courts since 1998 but left three years ago. “It is a very, very important job. If you don’t do your job correctly, you can really affect somebody’s life,” Prado says. *Morelia Orozco asked Medill Reports not to use her real name to protect her need for confidentiality.